Figure 1. 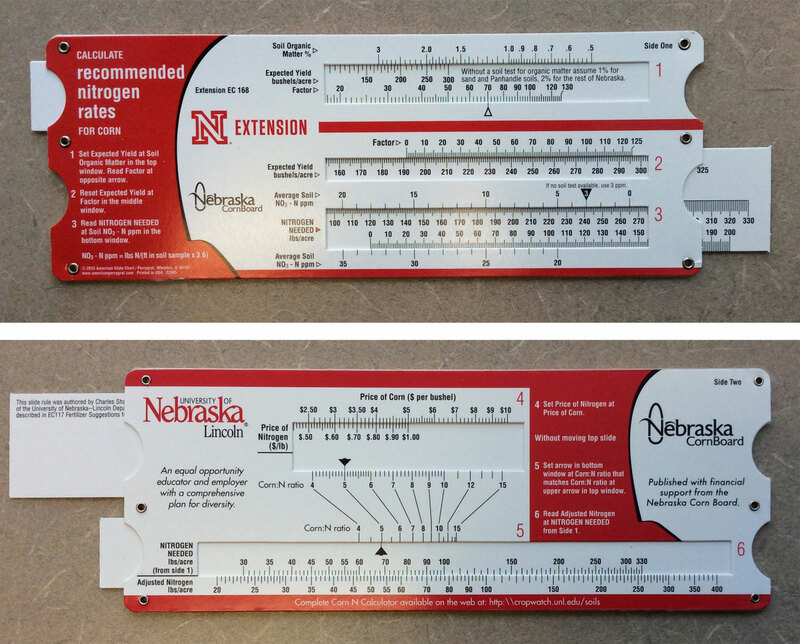 Calculate recommended nitrogen rates with this handy, pocket-sized slide rule. Corn farmers looking for a quick and easy way to calculate their nitrogen rate or consider adjustments based on nitrogen and corn costs will appreciate using the Corn Nitrogen Rate Slide Rule (EC168). This was produced with financial support from the Nebraska Corn Board and is back in stock and available free. 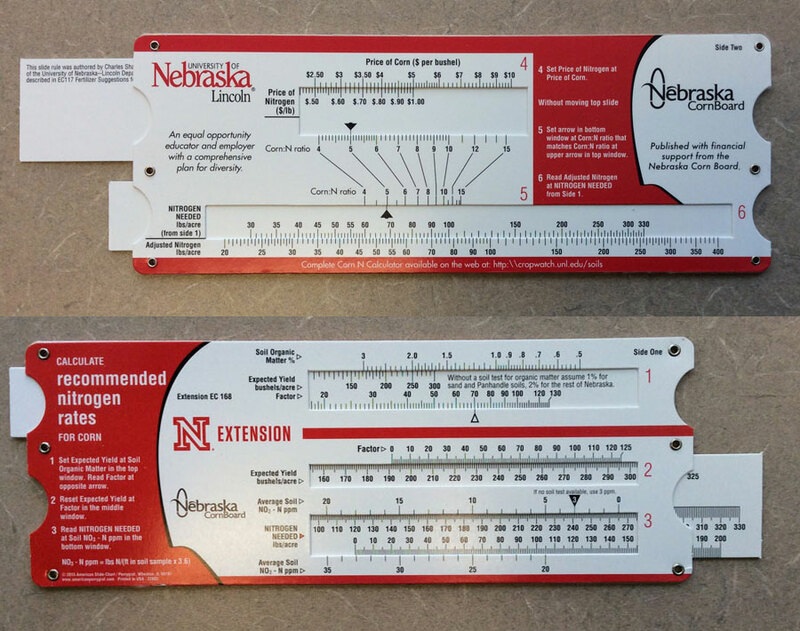 "The slide rule will help farmers know how much nitrogen is needed for corn and adjust for economic conditions," said Charles Shapiro, a UNL extension soils specialist. "It's important to apply nitrogen properly — the cost of under applying is always a lot higher than over applying." Complete UNL nitrogen recommendations and further information are available in Extension Circular 117, Fertilizer Suggestions for Corn. Slide rules can be ordered from local Extension offices or by sending a No. 10, self-addressed stamped envelope with enough postage for 2 oz to Charles Shapiro, 57905 866 Rd, UNL Haskell Agricultural Laboratory, Concord, NE 68728-2828. For more information on soil nutrients for crops, see the Soil Management section of CropWatch or the Soil Management sections of individual crops. Nutrient Management for Agronomic Crops in Nebraska (EC155). A guide to nutrient use from all sources for the production of Nebraska's major agronomic crops. Content in this 159-page, comprehensive book is divided into two main areas: the basic principles of soil fertility for the primary, secondary and micronutrients and fertilizer recommendations for individual crops.